Unlike all other living birds, the ostrich secretes urine separately from faeces. 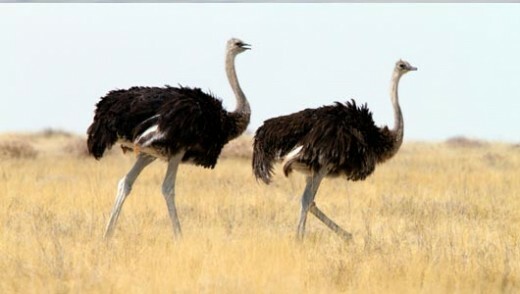 Ostriches’ running is aided by having just two toes on each foot (most birds have four), with the large nail on the larger, inner toe resembling a hoof. Ostriches’ wings reach a span of about 2 metres and are used in mating displays, to shade chicks, to cover the naked skin of the upper legs and flanks to conserve heat, and as “rudders” to help them change direction while running. Ostriches normally spend the winter months in pairs or alone and during breeding season and sometimes during extreme rainless periods they live in nomadic ‘herds’ of five to 50 birds led by a top hen, that often travel together with other grazing animals, such as zebras or antelopes. All of the herd’s hens place their eggs in the dominant hen’s 3m-wide nest, though her own are given the prominent centre place; each female can determine her own eggs amongst others. The giant eggs are the largest of any living bird at 15cm long and weighing as much as two dozen chicken eggs, though they are actually the smallest eggs relative to the size of the adult bird. The eggs are incubated by the dominant female by day and by the male by night, using the colouration of the two sexes to escape detection of the nest, as the drab female blends in with the sand, while the black male is nearly undetectable in the dark. When the eggs hatch after 35 to 45 days incubation, the male usually defends the hatchlings and teaches them to feed, although males and females cooperate in rearing chicks. Contrary to popular belief, ostriches do not bury their heads in the sand: the myth probably originates from the bird’s defensive behaviour of lying low at the approach of trouble and pressing their long necks to the ground in an attempt to become less visible. Their plumage blends well with sandy soil and, from a distance, gives the appearance that they have buried their heads in the sand. The Ostrich is farmed around the world, particularly for its decorative feathers and also for its meat which is marketed commercially and its skin is used for leather products. Ostriches have inspired cultures and civilizations for 5,000 years in Mesopotamia and Egypt. In some African countries, people race each other on the back of ostriches with special saddles, reins, and bits. The wild ostrich population has declined drastically in the last 200 years, with most surviving birds in game parks or on farms. Unlike most birds the males have a copulatory organ, which is retractable and 20 cm long. Lacking teeth, ostriches swallow pebbles to grind their food. An adult ostrich carries about 1kg of stones at any one time. Ostriches can go without drinking for several days, using metabolic water and moisture in ingested roots, seeds and insects, but they enjoy liquid water and frequently take baths where it is available. The ostrich has the largest eye of any land animal, measuring almost 5 cm across, allowing predators such as lions to be seen at long distances.